The idea was to create a piece using horizontal strips of all kinds to make a textural piece. About 1/3 of the way through, I realized it was looking landscape-like. So I started thinking along those lines, which is rare for me. Representational is not my usual approach. But this worked for me both abstractly and literally. 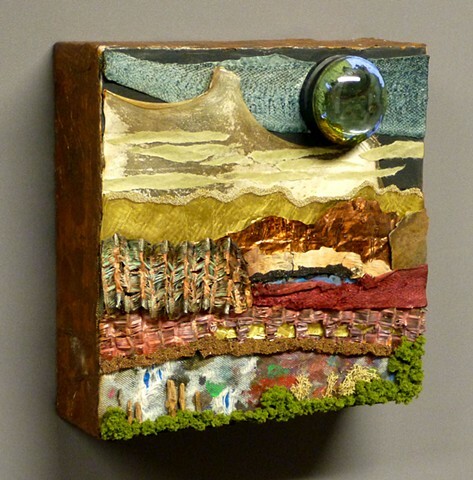 In addition to the condenser lens from an old film projector you'll find fish leather from Iceland, deer hide, brass and copper sheet, birch bark "paper,"radiator tape, a scrap of worn-out painting jeans complete with paint, bits of drift wood and mossy foliage.